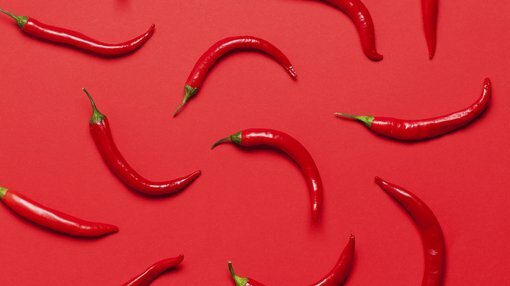 Hot Chili (ASX:HCH) has revealed the details of a potentially game-changing transaction that it’s undertaking with well-regarded Chilean mining group, SCM Carola. Following 18 months of high-level discussions, Hot Chili has executed a binding memorandum of understanding (MoU) for an option to acquire a 100% interest in Carola’s large landholding, which adjoins HCH’s Productora and El Fuego copper projects in Chile. 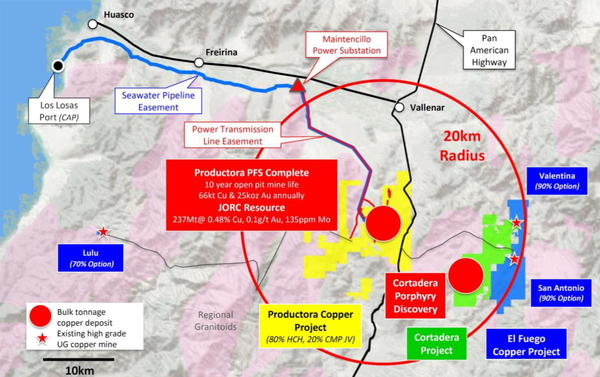 Most importantly, Carola’s Vallenar landholdings include a major copper-gold porphyry discovery, named Cortadera, which has never previously been publicly released, and which lies 14km directly southeast of Productora. This, in turn, is one of the most significant set of copper-gold porphyry discovery drill results since the discovery of SolGold’s (TSX/LSE:SOLG) Cascabel deposit in Ecuador. Successful completion of the transaction could lay a foundation for the creation of a new, globally significant copper development centred around two bulk tonnage copper-gold deposits: Productora (HCH 80%, JV partner CMP 20%) and Cortadera (Carola). It would also provide the immediate critical mass required to develop a new large-scale, long-life copper mine, transforming Hot Chili into a premium ASX-listed copper developer. 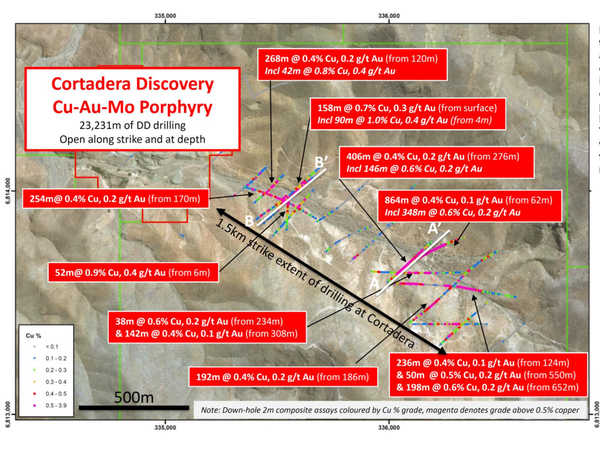 The Cortadera discovery remains largely open and has demonstrated potential to host a larger resource base than Productora, currently 1.5Mt copper and 1Moz gold. Drilling is set to kick off following the expected execution of a formal option agreement within the coming months. Hot Chili managing director, Christian Easterday, said the proposed transaction is pivotal for the company, and follows a similar move by neighbours Teck and Barrick at their Nueva Unión copper project in Chile (combining the Relincho and El Morro deposits to form a more robust consolidated copper development). “We are very pleased to have agreed the key commercial terms for an option to acquire 100% of Cortadera for incorporation into a single larger development with Productora, taking advantage of planned central processing facilities,” Easterday said. “Along with the recent consolidation of other high-grade satellite copper mines in the area, we have now assembled agreements to consolidate a truly world-class regional copper camp. “The new consolidated development has the potential to place within the production scale range of the top 30 largest operating copper mines globally. “We believe that combining Cortadera and Productora makes a lot of sense. “Hot Chili has entered into project-level, strategic funding discussions with key stakeholders in relation to the proposed Carola transaction,” Easterday noted. For the specifics of the MoU key terms, see the announcement released today. As mentioned, Cortadera lies 14km directly southeast of Hot Chili’s flagship Productora copper project, located at low altitude along the Chilean coastal range, 700km north of Santiago. A total of 39 diamond drill holes (HQ core) for 23,231m have been completed across a strike extent of approximately 2km at Cortadera since the copper-gold porphyry deposit was first drill tested and discovered in January 2011. The deposit comprises a cluster of outcropping tonalitic porphyry bodies, which have been vertically intruded along a regionally significant NW-trending fault corridor, through a shallowly dipping sequence of intercalated felsic volcaniclastics and sediments. Multiple phases of tonalitic porphyries have been mapped and recognised in diamond core including an early, intermediate and late phase of intrusion. Drilling across the porphyries recorded strong intersections of copper, gold, molybdenum +/- silver from surface to depths of approximately 900m vertical. Copper and gold show a strong correlation from assay results throughout the deposit with molybdenum generally increasing in grade at depth. The deposit is oxidised to approximately 70m vertical depth, with transitional oxide/sulphide mineralisation extending to approximately 100m vertical depth from surface. Copper is mainly associated with malachite and chalcocite within the oxide zone and chalcopyrite within the sulphide zone of the deposit. Investigation of detailed logging and surface mapping has demonstrated a close association of vein density and copper grade distribution. Higher copper grades within the oxide zone are associated with chalcocite, while higher copper grades within the sulphide zone have been related to high molybdenum grades, potentially representing a higher grade phase of mineralisation. Importantly, the deposit remains open at depth and along strike with several wide, higher grade drilling intersections not closed-off. Review of data collection procedures, QA/QC assay protocols and the retention of half core from drilling already completed, have provided confidence in the quality of diamond drilling and sampling undertaken to date. While no compliant resource has been estimated at Cortadera, the company considers that minimal work would be required to establish an initial and significant JORC-compliant copper-gold-molybdenum mineral resource estimate from surface. HCH also considers that the Cortadera deposit has demonstrated potential to host a larger resource base than Productora, currently 1.5Mt copper & 1Moz gold. The binding MoU provides the basis for the definition, potential acquisition and incorporation of Cortadera into a combined development plan with Productora and Hot Chili’s growing stable of high grade satellite copper mines. An estimated US$15 million of drilling and exploration activities have already been undertaken across Cortadera since its discovery. Retained half core and definition of three porphyry centres will allow HCH to move quickly and at low cost towards a dramatic re-shaping of the company’s open pit resource and reserve base. The potential combined development is likely to be one of the few low capital intensity, high- margin, large copper developments available globally. Moreover, given the shortage of new large copper supply from low-risk, stable mining jurisdictions, Hot Chili is now well-positioned to establish itself as a premier ASX-listed copper developer. Preparation of a formal option agreement is well-advanced; Hot Chili expects to ink the agreement and commence drilling across key areas of the Cortadera discovery within the coming months.